...and she was just going to spring over, when she heard a deep sigh, which seemed to come from the wood behind her. "There's somebody very unhappy there," she thought, looking anxiously back to see what was the matter. Something like a very old man (only that his face was more like a wasp) was sitting on the ground, leaning against a tree, all huddled up together, and shivering as if he were very cold. "I don’t think I can be of any use to him," was Alice's first thought, as she turned to spring over the brook:  "but I'll just ask him what's the matter," she added, checking herself on the very edge. "If I once jump over, everything will change, and then I can't help him." So she went back to the Wasp  rather unwillingly, for she was very anxious to be a queen. "Oh, my old bones, my old bones!" he was grumbling as Alice came up to him. "It's rheumatism, I should think," Alice said to herself, and she stooped over him, and said very kindly, "I hope you're not in much pain?" The Wasp only shook his shoulders, and turned his head away. "Ah deary me!" he said to himself. "Can I do anything for you?" Alice went on. "Aren't you rather cold here?" "How you go on!" the Wasp said in a peevish tone. "Worrity, Worrity! There never was such a child!" Alice felt rather offended at this answer, and was very nearly walking on and leaving him, but she thought to herself "Perhaps it's only pain that makes him so cross." So she tried once more. "Won't you let me help you round to the other side? You'll be out of the cold wind there." The Wasp took her arm, and let her help him round the tree, but when he got settled down again he only said, as before, "Worrity, worrity! Can't you leave a body alone?" "Would you like me to read you a bit of this?" Alice went on, as she picked up a newspaper which had been lying at his feet. "You may read it if you've a mind to," the Wasp said, rather sulkily. "Nobody's hindering you, that I know of." So Alice sat down by him, and spread out the paper on her knees, and began. "Latest News. The Exploring Party have made another tour in the Pantry, and have found five new lumps of white sugar, large and in fine condition. In coming back "
"Any brown sugar?" the Wasp interrupted. Alice hastily ran her eyes down the paper and said "No. It says nothing about brown." "No brown sugar!" grumbled the Wasp. "A nice exploring party!" "In coming back," Alice went on reading, "they found a lake of treacle. The banks of the lake were blue and white, and looked like china. While tasting the treacle, they had a sad accident: two of their party were engulphed "
"Where what?" the Wasp asked in a very cross voice. "En-gulph-ed," Alice repeated, dividing the word in syllables. "There's no such word in the language! "2 said the Wasp. "It's in the newspaper, though," Alice said a little timidly. "Let's stop it here!" said the Wasp, fretfully turning away his head. Alice put down the newspaper. "I'm afraid you’re not well," she said in a soothing tone. "Can't I do anything for you?" "It's all along of the wig," the Wasp said in a much gentler voice. "Along of the wig?" Alice repeated, quite pleased to find that he was recovering his temper. Alice looked pityingly at him. "Tying up the face is very good for the toothache," she said. "And it's very good for the conceit4," added the Wasp. Alice didn't catch the word exactly. "Is that a kind of toothache?" she asked. The Wasp considered a little. "Well, no," he said: "it's when you hold up your head  so  without bending your neck." "Oh, you mean stiff-neck," said Alice. The Wasp said "That's a new-fangled name. They called it conceit in my time." "Conceit isn't a disease at all," Alice remarked. "It is, though," said the Wasp: "wait till you have it, and then you'll know. And when you catches it, just try tying a yellow handkerchief round your face. It'll cure you in no time!" He untied the handkerchief as he spoke, and Alice looked at his wig in great surprise. It was bright yellow like the handkerchief, and all tangled and tumbled about like a heap of sea-weed. "You could make your wig much neater," she said, "if only you had a comb." "What, you’re a Bee, are you?" the Wasp said, looking at her with more interest. "And you've got a comb. Much honey?" "It isn't that kind," Alice hastily explained. "It's to comb hair with  your wig's so very rough, you know." "I'll tell you how I came to wear it," the Wasp said. "When I was young, you know, my ringlets used to wave "
A curious idea came into Alice's head. Almost every one she had met had repeated poetry to her5, and she thought she would try if the Wasp couldn't do it too. "Would you mind saying it in rhyme?" she asked very politely. As they had ventured to expect. But what was I to do, you know? My ringlets would not grow again. Because I wear a yellow wig." "I'm very sorry for you," Alice said heartily: "and I think if your wig fitted a little better, they wouldn't tease you quite so much." "Your wig fits very well," the Wasp murmured, looking at her with an expression of admiration: "it's the shape of your head as does it. Your jaws ain't well shaped, though  I should think you couldn't bite well?" Alice began with a little scream of laughing, which she turned into a cough as well as she could. At last she managed to say gravely, "I can bite anything I want,"
"Not with a mouth as small as that," the Wasp persisted. "If you was a-fighting, now  could you get hold of the other one by the back of the neck?" "I'm afraid not," said Alice. "Well, that's because your jaws are too short," the Wasp went on: "but the top of your head is nice and round." He took off his own wig as he spoke, and stretched out one claw towards Alice, as if he wished to do the same for her, but she kept out of reach, and would not take the hint. So he went on with his criticisms. "Then, your eyes  they're too much in front, no doubt. One would have done as well as two, if you must have them so close "
Alice did not like having so many personal remarks made on her, and as the Wasp had quite recovered his spirits, and was getting very talkative, she thought she might safely leave him. "I think I must be going on now," she said. "Good-bye." This episode remains somewhat controversial, since apparently the original document purchased from Sotheby's has never been authenticated, in part because the seller has remained anonymous. A member of the Lewis Carroll Forum has set down a short summary of why she finds the document questionable, noting among other things, that the writing quality is poor. It is true that the writing doesn't have Lewis Carroll's usual snap, at least in the context of the Alice books, though as the forum poster notes, he could write duds too. 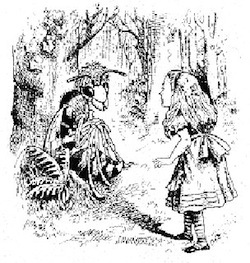 When it came to the Alice books, Carroll was a vigorous editor, and while Tenniel's reported marks about it seem quite negative, Carroll did not hesitate to cut or rework material. I cannot agree with the characterizations of this episode as "suppressed"  "suppressed" implies that the episode was removed under duress, and this hardly seems likely. Carroll had no difficulties arguing with Tenniel and insisting on what he wanted, to the point that Tenniel refused to illustrate The Hunting of the Snark. It is unlikely that Carroll would fold up when faced with editorial suggestions from Tenniel or anyone else. Alice in the Internet includes a scan of the illustration made "after Tenniel" for this episode by Ken Leader as a frontispiece for a published and annotated edition. I found it a bit difficult to make out, so here is a better colour-balanced look at it, though still quite pixelated. On rereading this little episode, not only is Alice behaving at times quite uncharacteristically, Carroll has already gone through some of this territory. He has already had bluntly rude characters making personal and inappropriate remarks about Alice's appearance, primarily in the form of Humpty Dumpty. Even the discussion of the word "conceit" has its better counterpart in Humpty Dumpty's declamations on the meanings of words. For all we know, this episode may have been included in the manuscript by accident, because with these points in mind it seems almost like a first run at what would become the earlier Humpty Dumpty episode. Overall, Through the Looking-glass has a more sobre tone to it, with the exuberance of Wonderland somewhat dampened. As Morton N. Cohen noted in his biography of Carroll, the book was published just three years after the death of Carroll's father, who had been a driving force in his path to ordination. In the end Carroll was ordained a deacon but never took vows to enter the anglican priesthood. His diaries from the period when he would have been making up his mind about this refer to his feelings of guilt and unhappiness, which have often been interpreted as his feeling unworthy of taking up the priesthood. However, it is just as possible that he was suffering from guilt feelings because he had not followed the path that his father had set for him. Whatever was happening, Carroll certainly wasn't in the same ebullient frame of mind while writing and editing Through the Looking Glass that he was for Alice's Adventures in Wonderland. "Engulphed" usually spelled "engulfed" is a firm denizen of the english language, and means to be swallowed whole. Unfortunately the probable pun is not evident to me here. There are a few features of this episode that mark it as a bit rough yet, and the dialect is one of them. The usage of dialect for humour is a delicate business, and it falls very flat here, especially a little further on when Alice prods the wasp into telling his story in rhyme. "Stiff-neck" is an archaic synonym for "conceit" which typically signifies excessive pride or snobbery. It can also be used to mean a literary or dramatic device (the term was originally applied to theatre and then extended to written works not intended for performance). This request by Alice is severely out of character in general and completely inconsistent with the way she has responded to offers of poetry recitals at other times. In many ways this would have been a nice touch to have in the story, a demonstration of Alice's ability to be compassionate. However, it's too grown up a thing to expect of a girl of nearly seven years, and tips into the almost maudlin. Carroll didn't always resist the urge to the sentimental, especially in his more serious poetry, but in the Alice books he had no truck with it in their final versions.